I have often heard people use the idiom “Life is just a bowl of cherries”. The saying can mean that life is great or it can mean just the opposite. ‘Tis true that life can be very pleasant most of the time but to be honest we must admit that sometimes life brings pain and suffering. Sometimes it is helpful to look at what others are saying about pain and suffering. 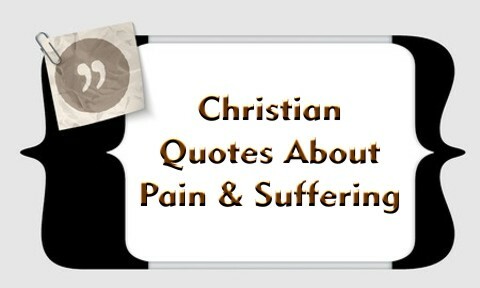 Listed below are my top 15 Christian quotes about pain and suffering. In light of eternity, suffering in this life if but for a moment. As we tolerate pain and suffering, not only personally, but for those to whom we minister, let us not ever lose sight of the fact that we have the hope of eternal life all because of the pain and suffering of our Savior, Jesus Christ. He showed us how to endure suffering and rose from the dead to prove victory over it. Praise Him for that! “I want to know Christ–yes, to know the power of his resurrection and participation in his sufferings, becoming like him in his death”(Phil 3:10). I guess he got what he prayed for…me…I do not pray that way. Suffering comes quite sufficiently without my praying to get more. I went to a retreat where the pastor had us read from a Benedictine prayer book. In it was an exercise to pray for hardship and suffering so that we might grow closer to Christ..uh, uh, I begged off. You ever sing that song, “Refiner’s Fire, my heart’s one desire…is to be like You” . I have….to my chagrin….looking back. What Christian doesn’t want to be like Him!? Its not that. Its the “Refiner’s Fire” part I sang in ignorance. Was it on this site or elsewhere I recently read what a refiner’s fire actually does? It burns the metal completely up, removing the dross. Removing the dross I ‘ll go for, its the burning and melting to a white hot heat I don’t care to go through. Did the author of that song really understand what he was perhaps inadvertently having Christians pray for when singing that song? I am with Augustine you quoted. I like to avoid pain. I want to stay close to Christ so that I don’t have to be chastised, punished, or refined. Its so much easier that way. Its like we teach our kids, we visit prisons. We do not reside there. We follow Christ in love and obedience. If He asks us to suffer for Him we do it. IMO, do not pray for suffering unless you are prepared for God to answer you. Next post: Is The Time Of Your Death Predestined By God?